SEJONG -- Two ministries, the Ministry of Interior and Safety and Ministry of Science and ICT, will join the Government Complex Sejong this year via relocation of their offices in Seoul and Gwacheon, Gyeonggi Province, to Sejong. While more than 2,000 civil servants from the two ministries will move to temporary buildings around the Complex Sejong by September 2019, new building construction is scheduled for late 2021. 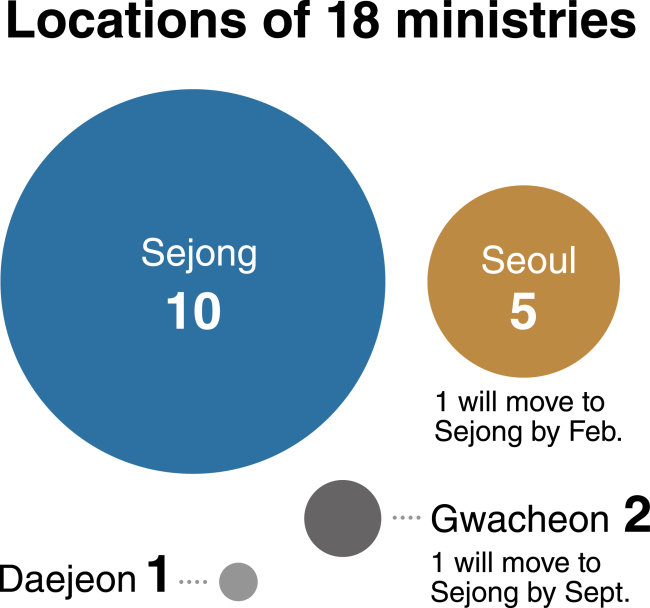 With their relocation, the number of ministries headquartered in the administrative-oriented city Sejong or its neighboring city will increase to 13 out of the total 18. The Ministry of SMEs and Startups is located in Daejeon, which is just south of Sejong. The remaining five are the Ministry of Defense (in Seoul), Ministry of Foreign Affairs (Seoul), Ministry of Unification (Seoul), Ministry of Gender Equality and Family (Seoul) and Ministry of Justice (Gwacheon). Apart from the government ministries, there had been growing calls among some portion of the public for relocation of Cheong Wa Dae and the National Assembly. As for the National Assembly, a consensus was made several years ago as to building the National Assembly Sejong as the subordinate headquarters for lawmakers instead of relocation from Yeouido, Seoul. Sejong City has secured 1 billion won ($887,000) in its 2019 budget for designing of the National Assembly unit. Though the figure falls short of the city’s initial demand of 5 billion won, the budget is expected to be enough for Sejong to break ground on the building before the current National Assembly’s term expires in May 2020. The “special self-governing” city was also given a budget of 200 million won to research the lawmakers’ building, under which a private or public outsourcing company selected by the National Assembly will start its project as early as this year. Candidate sites for the Assembly unit included a land beside Sejong Central Park, a land in Hapgang-ri, Yeondong-myeon and a land beside the Prime Minister’s Office across the city. The official also reported said that “even after the signing, the Public Procurement Service is to assess details (like construction costs). So it is hard to predict the period (procedures until groundbreaking).” He added that the Assembly Secretariat was banned from independently pushing any project worth 100 million won or more. In a similar vein, calls for setting up another presidential office in Sejong are growing in the political sector. Lawmakers with constituencies in the Chungcheong provinces that surround Sejong and Daejeon, are taking the initiative in the establishment of the presidential office unit after President Moon Jae-in’s pledge to relocate the office to Gwanghwamun in downtown Seoul. Rep. Jo Seung-lae from the ruling Democratic Party, held a meeting with provincial politicians on discussing ways to generate a public consensus on establishing the second presidential office in Sejong. Jo’s constituency is Yuseong, Daejeon. Jo, via his online account, recommended the president to make direct communication with regional citizens through the office unit. 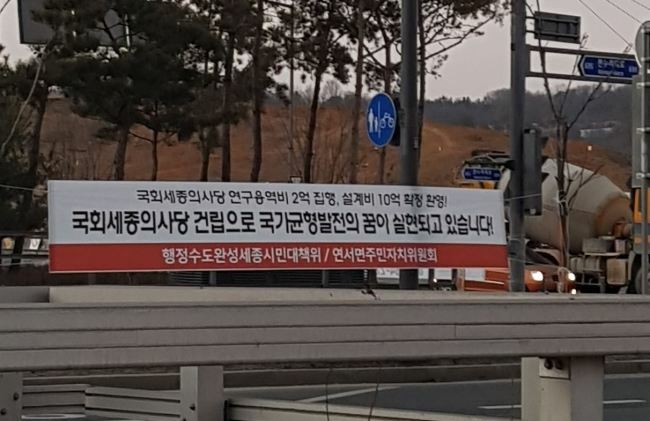 Meanwhile, the distance between Sejong and Cheong Wa Dae -- about a two-hour drive -- has been pointed to as a source of inefficiency despite the video conference system for the Cabinet meetings.